Buried in the back of building 5 at AIX, we found Thompson Aerospace, headed by machine-gun speaking Mark Thompson, we were greeted with a fusillade of facts and IFE prognostication: “We are not an IFE manufacturer,” he said, “We are a ‘focused solution’ company, founded and funded by aerospace professionals.” And yes, their business card says it all – “Specializing in Improving Airline Economics.” This is a great value proposition for airlines because his focus is airline profit. IFE, according to Thompson, is just another road to profitability and that credo seems to have leaked into every technical decision in the development of their system. 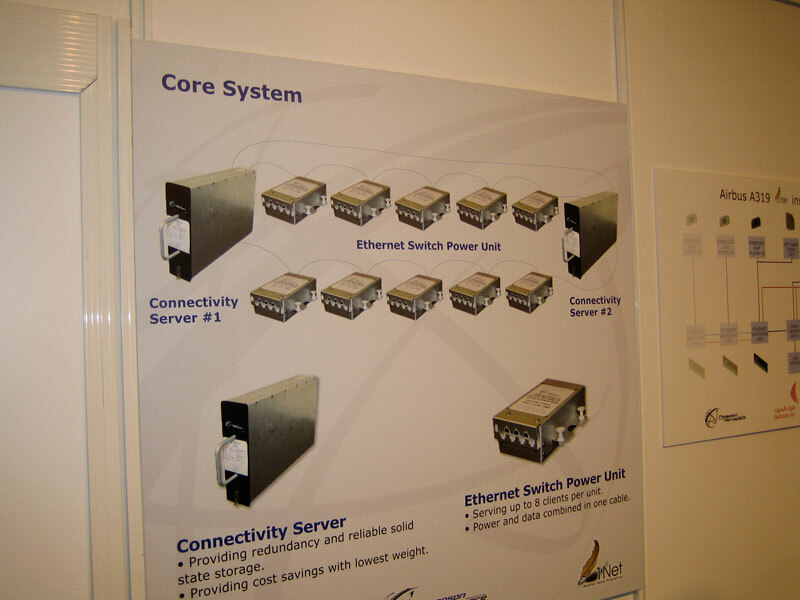 For starters, the Thompson system is based on an Ethernet 100 Base-T backbone. Each IFE installed seat (including cabling) is only a 3.3 pound addition to the aircraft weight and uses some 10 watts. That is quite respectable! 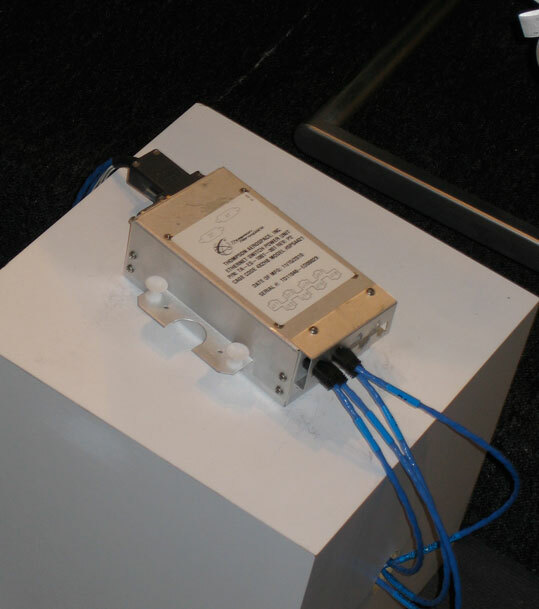 Initially targeted for single-aisle aircraft, the Ethernet seat boxes are designed for sidewall installation and can serve up to 10 passengers (sounds like twin-aisle capability to us). The design of the box has been optimized by Thompson and, noted Mark,”…the cabling has been reduced by 2/3, as well as, the cost of the cabling.” It looks to us like Thompson has taken an optimization razor to the whole system and what results is a very airline/aircraft friendly design. We made the mistake of calling the system an Ethernet but we were quickly corrected by Mark. “We have developed a Local Area Network on an aircraft.” It seems that the focus is on the aircraft and Thompson is aiming for an optimization of the electronics functions in an effort to deliver a lower cost solution for airlines that has great money making potential. For a better understanding of their value proposition, check out the comparison tool on their website. The Thompson system is over 3 years in the making. The first year, the team visited and talked to airlines to get data on what airlines needed and what business model would work. In the second, they developed requirements and a spec that outlined the business plan and the hardware plan. Good idea! 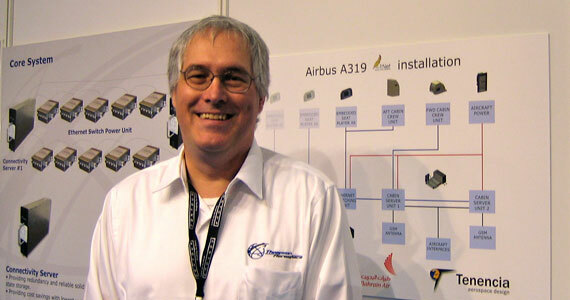 The system evolved into a first sale to Bahrain Air and a model with which to go forward. Mark Thompson told IFExpress, “We sell each seat worth of IFE at $3K per seat. This includes the retrofit installation and certification,” he said. He also noted that if airlines go with Thompson, they deliver to the airlines 90% of the shared revenue. How do they get that revenue, you ask, “Advertisers and passenger purchases,” he noted. This is another interesting story as well. Each seat back display has a credit card swipe, the purpose of which, is to deliver a way to pay for items purchased in flight. 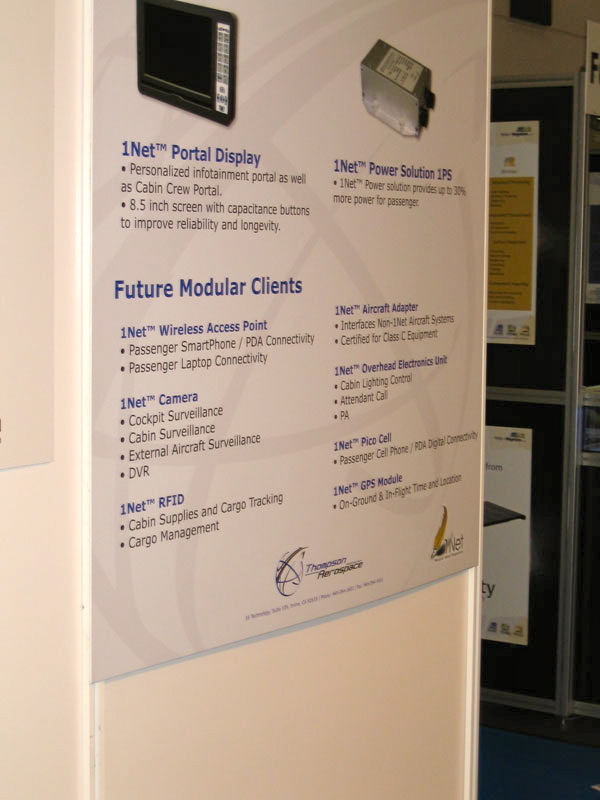 The fulfillment story is designed into the the two IFE system Ethernet servers that have celluar connectivity as they provide a way to upload what is for sale by advertisers and they also have the ability to deliver ‘thousands of pages of order info’ upon landing. Interestingly, vendors can upload their adverts themselves via the Thompson website and choose parameters like ad duration, routes, etc. This is a first, we think. To emphasize the revenue focus placed on the hardware, we asked about spares. While extolling us with reliability Mark made a curious statement, “I am not in the business if selling spares. It is a business function and we sell them at the same price as a baseline system. My job is to deliver a Google-like IFE model to the airlines.” That is refreshing news and we have Mark’s word to prove it. “The Thompson system costs 1/4 the the cost per flight of other systems and we can guarantee it!” We suppose he has a point when you take into consideration the low cost coupled with the revenue advantages of a web-based pay and advertising system. For more information, check their website or call Mark direct in Irvine at (949) 690-8668. Here are two more show images from the Thompson booth.